The stunning cover for issue#41 hides an interesting secret. What looks like a Split Bug Beetle on the surface holds a surprise in store for VWMA readers as they explore this custom creation belonging to Simon Bishop from Victoria. Simon's Beetle is accompanied by Glynn Whale's magic '65 Split Kombi and Tony Alcuri's magnificent stock '67 bug. 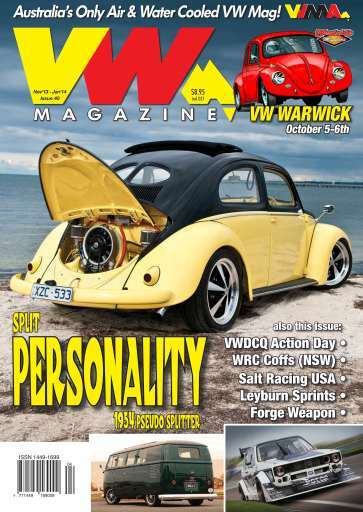 This issue also has extensive coverage of the VWMA drag racing weekend at Warwick, two days of action and excitement on and off the track. And for the watercooled fraternity, the Forge Mk1 Golf track car is heaven on bitumen. 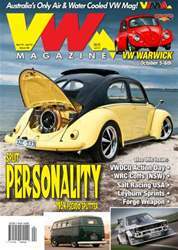 VWMA - all you need to keep you up to date with the VW world!